Like the first season, there are several episodes that form arcs throughout the season, which I kinda like as a series of twenty-two episodes, of twenty minutes each, always has the risk of being stand-alone and kinda pointless. There are very few single episodes in the second season, in fact, as all of them have links of varying strengths with each other. I think the most important of these arcs is that dealing with the Mandalorians, because it caused such a massive stir in the community at the time it was released. Up to this point (late 2009), author Karen Traviss had been behind several highly successful novels, including the Republic Commando series, and a few tie-ins to the new Clone Wars itself. Traviss had made a name for herself as the Mandalorian Queen, writing her clones as having a strong cultural tie to the Mandalorian, Jango Fett. Of course, Mandalorians had been popular within Star Wars fandom for years since Boba Fett’s costume made him so many fans, and they had grown into a race of superhuman mercenary awesome guys who we were pretty much browbeaten into loving instantly. Then we got episode 12 of Clone Wars season two, The Mandalore Plot. Turns out, the Mandalorians are a peaceful people, who have confined the war-like vestiges of their culture to the moon of Concordia (Concord Dawn, anyone?) and live in harmony much like the Naboo and Alderaanians we’ve come to know from the EU. The Duchess of Mandalore herself leads the pacifist Council of Neutral Systems, in fact. The arc features Obi-Wan investigating claims the Mandalorians are arming against the Republic, and we soon learn he and Duchess Satine have some prior history together. The two discover that a breakaway faction of Mandalorians have re-formed the Death Watch and plan to overthrow the pacifist government, with the help of Count Dooku. This arc is actually pretty great, if I’m honest. The Mandalorian controversy aside, I feel that it reaches deep into the Star Wars lore and provides a real treat for a lot of fans. Sure, there are many moments that I wish hadn’t happened – though at least Jar Jar wasn’t in any of them. I really enjoyed seeing the deepening of Obi-Wan’s character, and think the idea that he is actually a lot more worldly than many other Jedi provides an interesting tension with Anakin. There is a lot here that makes Obi-Wan a really interesting Jedi, one that certainly learnt a lot from Qui-Gon Jinn. There’s a pretty extensive arc set on Geonosis that, if I’m honest, just annoys me immensely. 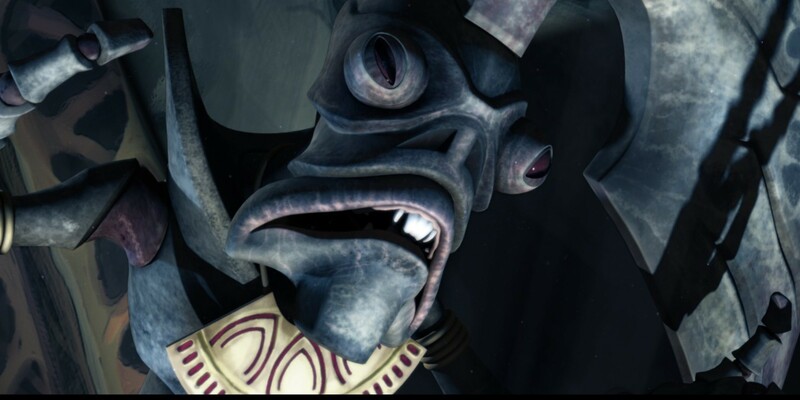 We get to meet the Geonosian Queen, and while that makes total sense, as the Geonosians are essentially bugs, the whole zombie/mind-control thing with the worms was just ridiculous, and seemed a completely contrived way to engender the danger for Ahsoka and Barriss. Oh yeah, Luminara’s back, and this time she’s brought her padawan with her. The two are terribly mishandled, in my opinion, and serve merely to show how much better Anakin and Ahsoka are. I find this a bit annoying, as Luminara and Barriss were officially introduced in the novel The Approaching Storm, specifically as a counterpoint to the master-and-apprentice relationship that Obi-Wan and Anakin have in Attack of the Clones. Barriss is probably a padawan for the longest time among all of the Jedi, and their roles here are the worst part of this for me, I have to say. And that includes having Anakin and Ahsoka throw Rex off a massive wall and then Force-leap to the ground after him. Harumph. 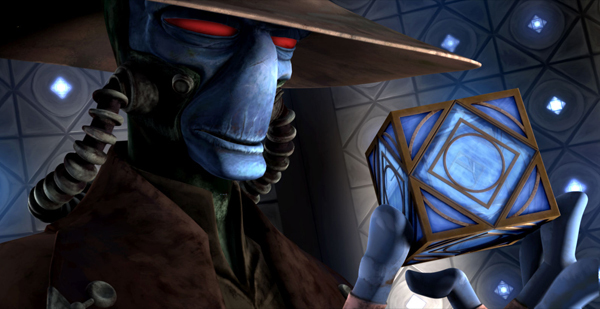 The arc that opens the season follows Cad Bane on a job for Darth Sidious, stealing a Jedi holocron that holds the names of all of the Force-sensitive children in the galaxy. Putting aside the issue of just why the Jedi have this information, but are seemingly doing nothing with it, the arc is something of a let-down, as we once again get to follow Ahsoka making a hash of things yet being thought of as some kind of kickass character, and Anakin being an incredibly bad example with next to no repercussions. It was good to see Bane again, though I do feel that he is the sort of character that would benefit from less exposure. His role here is okay, though, and we do get some absolutely wonderful film noir-like shots of him in his rented room, so I can’t complain too loudly! Bounty hunters suffuse the final arc of the season, as well, as we have what should be an absolutely awesome finale to the season. I think we all knew something was going to be up with Boba Fett going after Mace Windu after that scene in Attack of the Clones when he picks up his fallen father’s helmet, and while we did get a young adult series of books that dealt with this (I should do a blog on those, they had some good moments), none of that is canon anymore. 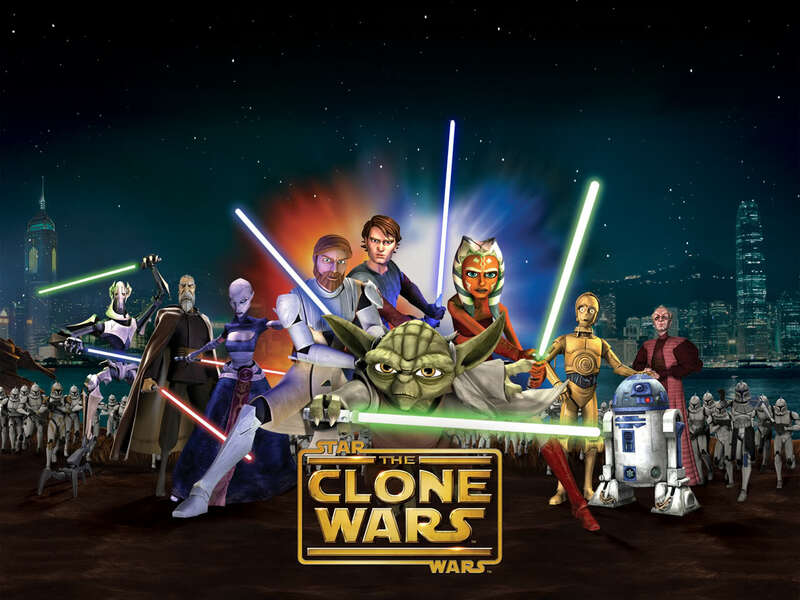 Clone Wars has essentially re-done the storyline, and I have to say, I’m surprised nobody had thought of doing this previously with the character. Boba Fett is a clone, so he infiltrates a Jedi cruiser (I still find it hilarious that they’re legitimately called that) as a clone cadet! It’s kinda genius, I thought! Of course, he glowers and grimaces a lot, and it really is obvious that he’s not one of them, though I suppose the writers need to telegraph these points to the target audience. It’s a really terrific conceit, and they even got Daniel Logan back to play him (and the other cadets). It turns out that Boba is being helped in his vendetta by Aurra Sing, who is just as crazy as the EU had us believe all these years. We even get to hook up with Hondo Ohnaka once again! However, the arc is just a bit too, well, obvious in the way it goes. Clearly Boba isn’t going to get to kill Mace, because Palpatine does that in Revenge of the Sith, but there was a certain stilted feel to the three-part arc, that really disappointed me, as it should have been tremendous, by rights. At any rate, I think I should probably draw this to a close now, because I could ramble on all day. This is by no means a complete look at all of the episodes – the Zillo Beast is rightly left out, I feel, and while it’s cool to see folks like Mon Mothma show up, Senate Murders was something of a low point for me. But I wanted to give at least a rough overview of the season, and I suppose my top three episodes overall! This was actually more difficult than for season one, as I don’t really like any of the episodes from this season – those on this list are therefore the best of a bad bunch, ones that I can just about tolerate. Death Trap is top merely because of the awesome idea of having Boba Fett infiltrate the clone cadets; Holocron Heist has some wonderful visuals of Cad Bane, and Duchess of Mandalore has some great cat-and-mouse intrigue on Coruscant. I wouldn’t really say I love these episodes, but they’re the best I can come up with, if I’m honest! How about you guys? Shocked at how harsh I was on the Zillo Beast?! Can’t stand the Mandalorian controversies? Let me know in the comments! Previous Previous post: Summoner Wars!